The Gran Mision Vivienda Venezuela, the Chavernment’s house-building program, is going into overdrive right before the election. Of course, unintended consequences come along any rushed process, like workplace accidents. 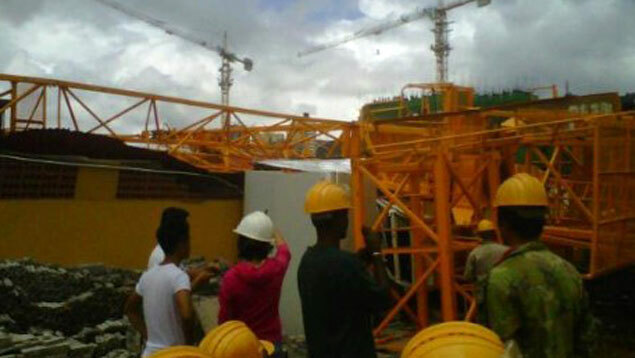 Six workers were injured when a construction crane fell down in Ciudad Tiuna, a huge housing project located inside the Caracas’ military complex known as Fuerte Tiuna. Three of them are hospitalized, one with his skull fractured. All six are of Chinese nationality. This accident happened days after Hugo Chavez himself announced on the site that 30.000 apartments will be built inside Fuerte Tiuna with help of China, Belarus and Russia. Chavismo is committed to delivering the highest number of houses and apartments in the shortest period possible, regardless of the enviromental damage or the deplorable quality of the construction. Foreign workers are been used all across Venezuela, to the displesure of their domestic counterparts. Latest estimates indicate that at least 30.000 Chinese workers are right now in the country, as part of the so-called Chinese Fund agreement. And they’re doing all this effort, just to back the promise of well-produced election spots.